I have to admit that I have never made a vegan dessert before. With recipes that call for butter and egg substitutes, I was afraid of sacrificing taste and texture to make a vegan dessert. However, when making cupcakes for a vegan friend, I started exploring new blogs with vegan recipes that don't require any substitutes. 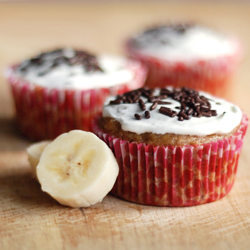 In fact, these banana cupcakes can be made with ingredients you probably already have in your pantry! I love baking with banana, and these cupcakes were sweet and moist - perfect for all of your vegan and non-vegan friends to enjoy. Add oil, non-dairy milk, vanilla, and almond extract and mix until combined. Stir in flour, baking powder, baking soda, salt, and sugar. Do not over mix. Fill cupcake lines 2/3 full and bake for 20-22 minutes. Inspiring... you friend is very lucky =).... and it looks delicious. It's so nice that you decided to make a vegan dessert for your friend. A lot of people think you can't have a great tasting treat if you don't use regular eggs, milk, and even flour. They are so wrong. Once you start exploring recipes, you realize there's plenty of options available for you to try. Yum! What a recipe. I love all things banana. Just wanted to let you know that meringue powder is made out of eggs, so the frosting is not vegan. Really nice and healthy cupcakes! It's a pity you didn't publish more images! Oh man they look insane!